A unique collaboration between Disney and Square Enix, Kingdom Hearts: Chain of Memories picks up where the original Kingdom Hearts game left off. 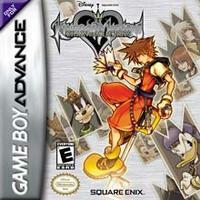 Sora's new journey begins at a crossroads of fate, where friendships are lost and darkness overwhelms the heart This installment features a brand new card-battle system tailored specially for the Game Boy Advance. Experience this exciting new adventure on the go! Use special cards to summon familiar characters from the original Kingdom Hearts. Combine different cards for a variety of abilities, spells, combo attacks, and tactics. Travel through highly interactive environments as you unlock doors and find treasures. Meet over 100 of your favorite Disney and FINAL FANTASY characters. Prepare for battle by raising your attributes through an innovative game system.